6 to 8 bamboo skewers, soak in water for 10 minutes. 1. Mix together all above ingredients except for Pink Diamond Sea Salt, shrimp and bell pepper. 2. Pour mixture in large zip-lock bag then add shrimp then seal bag. 3. Place bag in refrigerator and marinate for 2 to 3 hours. 4. 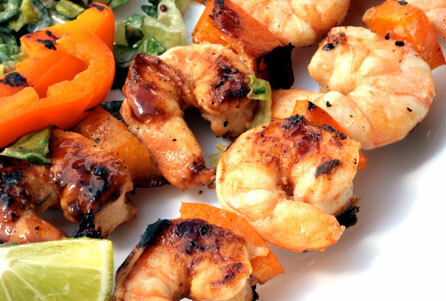 Skewer the shrimp and bell pepper on bamboo skewers, then grill on low heat for 2 to 3 minutes on each side. (Broil is fine). 5. Finish with a sprinkle of Pink Diamond Sea Salt, Serve over basmati rice.